Imagine a sporting event, a baseball game or football game. You're sitting in a lawn chair, your barbecue grill is roasting burgers, sausages, chicken, and all the essential elements are present: plenty of food, alcoholic beverages, your friends and family . . . BUT you're in a parking lot surrounded by hundreds of automobiles and the barbecue grill, table, chairs, your friends are clustered behind your car. Sounds strange? Sounds uncomfortable? No! Sounds like a tailgate party. A tailgate party is a social event. It's held on and around the open tailgate of a vehicle usually before, and sometimes after, a sporting event. 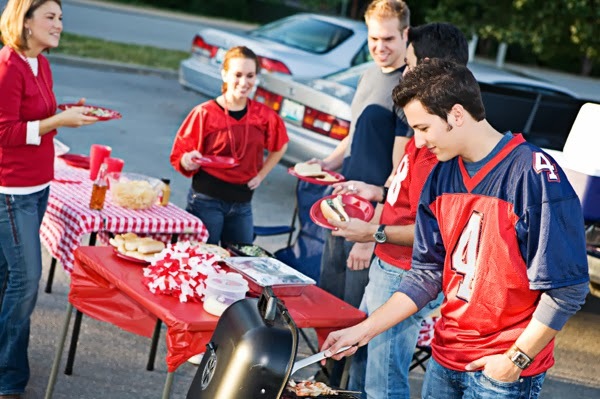 A tailgate is the back door of a station wagon, SUV, or truck and a tailgate party refers to an informal meal served from the back of a parked vehicle, typically in the parking lot of a sports stadium. This type of gathering is so popular in the USA that we have a verb for it, to tailgate, and people participate even if their vehicles do not have tailgates. I went to a tailgate party yesterday before a baseball game. It rained. Even so, it didn't stop the party; people were enthusiastically tailgating in spite of the wet weather . . . and I ate a lot! I recommend starting this trend in your country and try tailgating before your next sporting event. Remember, you don't need the tailgate to have the party.